Pride cometh before the fall, Josie. Riverdale Season 2 Episode 7: "Chapter Twenty: Tales From the Darkside"
Betty: Veronica, I have a theory...about Sheriff Keller. Veronica: Oh, me too. It’s obvious. Betty: He’s The Black Hood. Veronica: He’s having an affair. Veronica: What?! Is that a joke? Betty: I wish it were. Veronica: Whatever crazy web you’re spinning, B. Let me break it down for you. Sheriff Keller’s wife is away, he’s failing at his job. He’s looking for comfort, sneaking around. All signs point to cheating. Betty: Well, I don’t know. Maybe he’s having an affair and he’s The Black Hood? Permalink: All signs point to cheating. Jughead: What the hell game where you playing, Penny?! You lied to me. My dad’s fine. 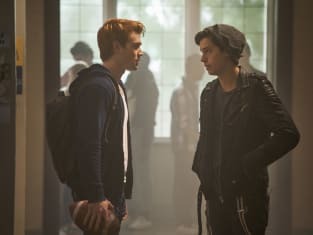 Jughead: No, you said this was going to be a one and done. Penny: It’s not like you have a choice. Penny: It’s insurance you do what I say. And if you cause a stink, or try to back out, or raise your voice to me ever again, I will make sure that video goes straight to the Sheriff’s office. God, I imagine what that’ll do to your dad’s heart. Break it, right? Penny: FP made me a promise that he didn’t keep. And as far as I’m concerned, his debt is yours. And I’m just getting started with you. Permalink: FP made me a promise that he didn’t keep. Riverdale Round Table: Who Could Be The Killer Now?